The world's first additive manufacturing (3D printing) machine that can make plastic parts as fast and as cheaply as traditional manufacturing is being developed at the University of Sheffield's Advanced Manufacturing Research Centre (AMRC) with Boeing. Based on the Advanced Manufacturing Park (AMP) in Rotherham, the AMRC is a world-class centre for innovative research and focuses on advanced machining and materials research. A 2,700 sq m extension houses the Design Prototype & Test Centre (DPTC) that bring together design and prototyping with structural testing, key areas in the research of high-value manufacturing sectors such as aerospace, energy, motorsport and medical technology. The new machine will build parts up to three times larger and 100 times faster than current comparable additive manufacturing (AM) machines, making it capable of challenging conventional injection moulding for high volume production. The £1m project – funded by the Engineering and Physical Sciences Research Council – has the potential to transform both manufacture and distribution. Low cost, high volume additive manufacturing would enable parts to be made where they are needed, rather than produced centrally. 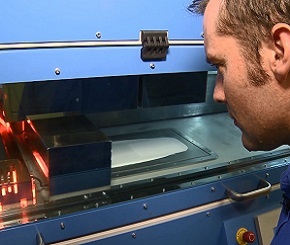 Professor Neil Hopkinson from the University of Sheffield's Faculty of Engineering, said: "Additive manufacturing is already being used to make tens of thousands of a product – such as iPhone covers – and ten years ago that volume was unthinkable. This machine will enable serious production of volumes over one million, which is currently inconceivable. I believe history will repeat itself and in ten years' time, producing volumes over a million using additive manufacturing will be commonplace." The machine is based on a technology developed by Professor Hopkinson, who originally filed patents on the process as lead inventor at Loughborough University. The technology for HSS is being licensed to industrial machine manufacturers on a non-exclusive basis, with new machines being expected on the market from 2017/18. The machine will initially be built at the AMRC before installation in the University's Centre for Advanced Additive Manufacturing (AdAM), of which Professor Hopkinson is director. Dr Andy Bell, design manager at the DPTC, said: "This machine will be built completely from scratch, drawing on all the skills and expertise of our design engineers. We have been involved in developing machines with commercial partners in the past, but this will be the biggest machine we have ever created."